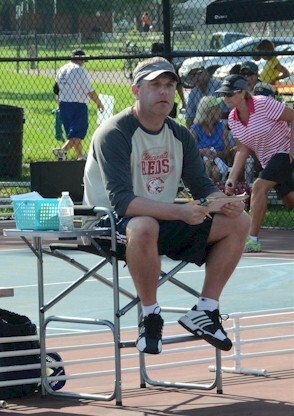 This previous weekend I had the opportunity to debut my refereeing “skills” in a USAPA Sanctioned Pickleball Tournament. In fact, I refereed 13 total matches over the course of the day last Friday and Saturday. In preparation for donning the “black-and-white pinstripes,” there were four pickleball rules that I studied and hypothesized may be a point of contention during one or multiple matches – the underhand serving motion, momentum and the non-volley zone, carry and double hits and, finally, shots around the net post. I was prepared. The matches on day 1 and thoughout the morning of day 2 went smoothly without issue. I called the scores clearly and loudly. I figured out what to do with the clothespins that had “1” written on one side and “2” written on the other. I even managed to keep track of the player positions – even when the players themselves were confused. Twelve games up, twelve games down with no “controversy.” Of course, it didn’t last. It wasn’t a huge controversy – but it was “controversy” nonetheless. Here’s what happened – and, of course (insert reference to Murphy’s Law here), it happened late in the match at a fairly critical juncture. The ball was served. Just prior to the return, the returner’s partner yells “hold ‘em” [as if saying to the partner, “ let’s win this point so that we can get a sideout and get the serve back again”]. Upon hearing the returner’s partner yell “hold ‘em” the serving team stopped playing and once the return was made, absolutely no effort was made by the serving team to execute the 3rd shot. The returning team thought they had won the point because they executed the return and the 3rd shot by the serving team was not attempted. They went on to say that yelling “hold ‘em” was a form of team communication – which, even according to Rule 12.H, in-and-of-itself is generally not considered a distraction. Of course, the serving team had a different opinion. However, the referee’s decision is the only opinion that really matters. My decision was to replay the point. As a referee, there were two considerations I factored into my decision to replay the point: (1) Absolutely no effort was made by either player on the serving team to hit the 3rd shot. They literally stopped playing upon hearing “hold ‘em” from the returning team. (2) “Hold ‘em” sounds a lot like “hold-up.” My guess (it’s admittedly a judgment call) is the serving team, upon hearing “hold ’em,” stopped play because they thought a ball may be posing a danger to one of the players somewhere on the court. Replaying the point seemed to me to be the best and fairest option for both teams. It also seemed to be the most commonsensical thing to do. There’s a fairly lengthy discussion about Rule 12.H (Distractions) in the IFP Official Tournament Handbook. The last 3 sentences seem to be most relevant to the situation: “Note: In Doubles, team communication shall not normally be considered a distraction. However, loud communication at the time the opponent is about to strike the ball may be considered a distraction. If in the judgment of the referee, a distraction has occurred, it shall result in the loss of the rally.” In this case, my judgment call was that it was, indeed, a distraction. However, I didn’t award the serving team the point – rather, I had them replay the point. Did I make the right call? What say you? Has this exact scenario ever happened to you? Have a great weekend everybody. See you on the courts! With less than a year of PB experience, I would agree with the replaying the point. Where I play most, I suggest replaying points when there is an issue – good or bad for my side. We’ll see what happens if I play in a tournament. I would hope the same decision. Thanks for your comment, TAB. Glad that you’ve picked up the game in the past year. Fun times! See you on the courts! They communicated loudly. The opponents were about to strike the ball. The opponents stopped. Why did they stop? They were distracted. Why were they distracted? Because of the opponents’ loud communication. End of inquiry. The communication caused a distraction. It’s a fault and the serving team scores a point. p.s. If I were refereeing this match and were not positive of the result, I would not have guessed. I would have called over the tournament director and sought advice. Hi Burt, Thanks much for your feedback. You’re absolutely correct on all counts. The serving team should have been awarded the point. Should this scenario happen in future matches, I now know exactly how it should be called. (Luckily, the serving team did, in fact, win the match). Ironically, it was the receiving team that was “upset” (not really) that the point was replayed. Go figure. Thanks again. See you on the courts! Thanks, Ton, for your comment & feedback. Enjoy your day — and hopefully, pickleball will be a part of it!